Chipotle’s chicken – my son is wild about it & orders the Chicken Burrito every time he goes, which is as often as he can. He isn’t the only one that likes Chipotle: there’s always a line, there are numerous Copycat recipes and a fan site. People are crazy about Chipotle. I thought it was high time I made a Chipotle Chicken Burrito Copycat Recipe at home. For fast food, Chipotle uses decent ingredients, spans a wide taste range from mild to hot and delivers a huge, one pound burrito for about eight bucks. Think about it, though, that’s eight bucks a pound, which ain’t so cheap. Especially when you think about how cheap the ingredients actually are…Heck, you can have a steak at home for that price! And throw in the sides, too! I ended up making quite a study of it, this Chipotle Chicken Burrito Copycat Recipe. I didn’t mean to. I didn’t want to. I just wanted to make a flippin’ burrito for my kid. 🙂 I started around October with a copycat recipe, and disappointed, in the next few weeks I tried every “tastes just like Chipotle” recipe I could find, around a dozen or so. None of them did. I searched for hints and clues from Chipotle’s site and employees. For months (obsessive much? yeah…) I studied, tasted, and refined, again and again. When I thought I was close, I’d buy a bowl with Chipotle chicken (but to the side so it touched nothing else) and do a side by side tasting, then go back to the whiteboard. This week, Kraig gave Chipotle Chicken Burrito Copycat Recipe the thumbs up. And I don’t want Chipotle’s anything for a long time! So no wild, self-aggrandizing claims here of “It tastes just like Chipotle.” Just a humble (or not), “This is as close as I can get to Chipotle’s, and I hope ya like it! !” As a matter of fact, I’m pretty darn sure you will! Update: Chipotle Mexican Grill now has a complete list of every ingredient. That would have saved me a lot of work! I was pretty darned close in my original recipe and I’m not changing it even if there is a little slight variance in my ingredients compared to Chipotle. I like my Chipotle Chicken Burrito Copycat Recipe just the way it is! See, when I started out, I had a preconceived idea that Chipotle’s Chicken was a little hot. But it’s really not “hot” at all. And I thought maybe Chipotle’s partial recipe for an Adobo sauce might be a starting point. It wasn’t. Neither was starting with a can of Chipotle Peppers in Adobo sauce (although we will use a tiny bit of a Chipotle pepper and some chipotle pepper powder.) A lot of my experimenting was cutting back on the spiciness and ingredients. So what you’re going to see here is a Copycat Recipe for Chipotles Chicken like no other out there; a recipe as close to the taste of Chipotle’s actual chicken as I could get. Surprisingly, it uses very little of the marinade ingredients, and it IS absolutely key that it marinates overnight. You’re just going to have to trust the process. Some Chipotle Grills use a flat top and others grill, and each has its own distinct flavor. Even on my grill, I couldn’t seem to get mine as smoky as the Chipotle restaurants that grilled their chicken – maybe a little mesquite on the coals or few drops of liquid smoke in the marinade would do it. The chicken is a reasonably priced ingredient. Beans? Rice? Some of the cheapest foods out there. Cheese, sour cream, even tortillas? Regularly on sale. Pico de Gallo? The fresh ingredients might vary, but a small amount won’t break the bank. I knew I could do better than Chipotle Mexican Grill’s pricing. Here’s the rundown for 4 huge burritos: Chicken $1.99 a pound, 1 pound beans & some onion, used about 1/3rd is 40 cents. 2 cups of rice about 8 cents. Sour cream $1.00. Salsa (2 tomatoes, onion, jalapeno, lemon & lime which are also in the rice) $2.00. Cilantro 99 cents a bunch, about 30 cents. Can of Chipotle peppers, $1.89, for the recipe, about 20 cents (freeze the rest). Cheese was $1.77, we used about 3/4’s so it was $1.38. The giant tortillas ran $2.59 for 8 so we used 1/2 for $1.30. Of course, you’ll want to make good use of the extra ingredients. The total for four burritos was about $8.10. So a Chipotle Chicken Burrito holds pretty much up to the “rule of thumb” I’ve found over the years by comparing prices. With the exception of salads (which cost 4 to 10 times as much in a restaurant) most restaurant meals for one come in around the same price as that same meal at home for four. The initial outlay of cash may be a bit more (obvs you can’t buy just four tortillas!) so I have to assume the extra ingredients will be put towards other meals and I don’t include the cost for the additional ingredients. This rule of thumb seems to hold true for anything from fast food to high-end restaurants. The best copycat for Chipotle Mexican Grill’s chicken you’re going to find. Succulent, juicy and flavorful with just a bit of spice, just like Chipotle. Mix all ingredients in a Ziploc bag, squeezing out excess air. Massage thoroughly into and around chicken. Place in a container in the fridge. This needs a long marinade process, 12 to 24 hours; Mix the evening before for dinner the following day. When ready to cook, place chicken on hot grill or hot skillet over medium-high heat and grill or cook until just done. Remove, rest a few minutes if able, then chop into small pieces. 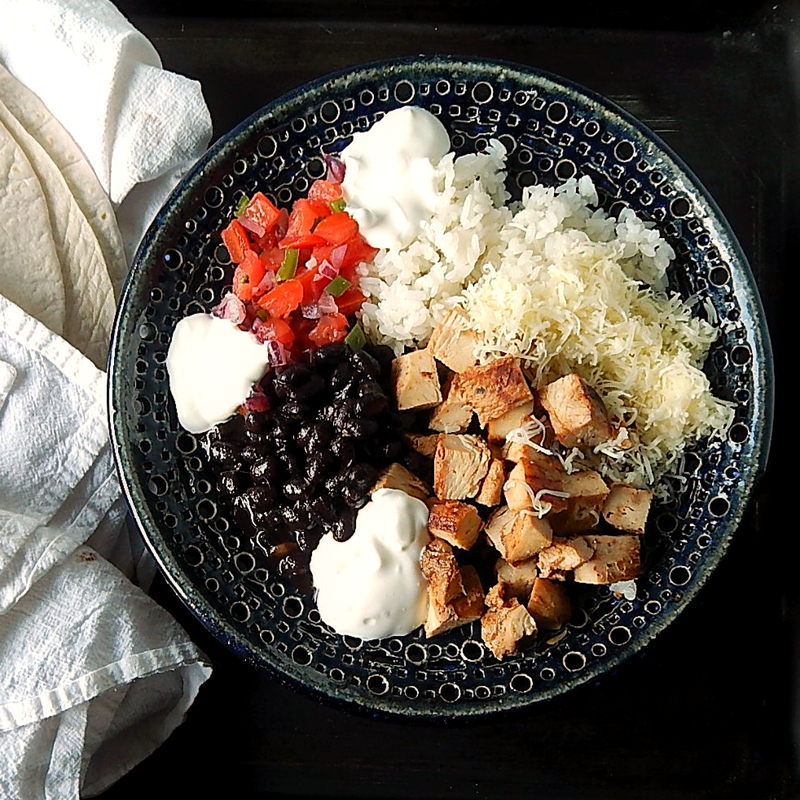 Save chicken and any juices together to make the burritos or bowls. You may wonder about the very small amount of Chipotle Chile from the canned Chipotle in Adobo and the tiny amount of the Chipotle powder. I don’t know what the restaurant actually uses, but I tried many variations of many combinations of the two as well as tried using just one or the other – using both makes it taste more like the restaurant version. Vinegar: I found nothing that indicated Chipotle uses vinegar, but vinegar (standard to an Adobo sauce) adds a little pep that is missing in other home-made versions. * If the chicken is thick, slice in half horizontally. **Scant is not used in recipes as often as it used to be; if you’re not familiar with the term it means to slightly short the measurement, but not quite by half. If you don’t have the 1/8th inch measurement, just use a good pinch of the oregano and pepper. The order of the ingredients is very important for a successful roll. The order should be rice, beans on top, but use a slotted spoon to drain off the excess moisture, chicken, salsa, sour cream and then cheese. Place all ingredients, in proper order on the tortilla, but when placing the ingredients, don’t put them in the exact center, but just slightly toward you. in the bottom third of the tortilla in a horizontal row. Fold the portion closest to you toward the back while at the same time, tucking in the sides. I’ve found that it takes a deft hand because there are going to need to be a couple of little adjustment tucks as you go. Once the top is over, pull it towards you, pressing down a bit, tightening up the burrito and then finish the roll. A good tight burrito actually tastes different than a loose one – all the flavors are forced together and meld throughout the burrito. Wrapping in foil seems to not only keep a mess from happening but also continues to steam the tortilla a bit – and that texture is more important than the type of tortilla used – even a thicker tortilla seems more delicate. The texture of the tortilla is very important to a successful burrito. The tortilla should be steamed and soft. I find the easiest method is to wrap several in clean towel, place in the microwave for about ten seconds, turn over and microwave 10 more seconds. Keep wrapped and pull out one at a time. If the tortillas are dry, wrap loosely in a slightly moist towel. Wet the towel, wring it thoroughly to remove as much moisture as possible, then microwave the tortillas. Don’t leave them in the wet towel when done, fold each into quarters and place, stacked into another towel to keep them moist. The other ingredients that Chipotle uses in their marinade, as stated many times by Chipotle employees, are missing. That recipe from the Huff Press has caused many people to buy a can of Chipotle Peppers in Adobo sauce, remove most of the peppers, and use the canned adobo sauce left behind along with the ingredients that Chipotle listed in that partial recipe for adobo. That makes NO sense because these cooks are doubling down on the adobo: using the canned adobo AND ingredients from a “partial” recipe for adobo. Chipotle indicated they were giving a “partial” recipe and these cooks are not adding the missing ingredients from the adobe. These cooks also aren’t adding in the other ingredients that employees have stated over and over Chipotle uses in addition to adobo. The adobo, while fine for the chipotle peppers inside the can, isn’t something you’d want to eat. Taste it. Is it good? Do you want to eat more? That should be the first clue. Adding a bunch of junk that’s already in there isn’t going to improve it. After the chipotle peppers are removed, the sauce amounts to about to about four ounces. Since home cooks are making a pound, maybe 20 ounces of chicken, the proportion of adobe to chicken is way off. Way, way, way off. This entry was posted in Click here for Bargain Meals, Click here for Fabulous Food Posts and tagged Bargain Meal of the Week, Chicken, Chipotle, Chipotle's Mexican Grill, Condiments, Mexican or Southwestern, Sandwiches. Bookmark the permalink. I tried this over the weekend and it is delish (I have not tried chicken at Chipotle, so I can’t comment on how “close” it is.) I doubled the recipe, marinaded for 24 hours, then cooked indoors using a grill pan. This is my new “go-to” recipe for any chicken that is needed for a mexican or tex-mex dish. Thank you so much for all the work you put into perfecting this! I’ve worked at Chipotle for a while, I would say it was damn near dead on to Chipotle’s chicken except even better! Thanks so much Kraig and I love that you stopped by and commented!! Happy 4th of July!! Since you absolutely nailed the chicken… question about the rice – do you add it to the rice cooking liquid or after the rice is cooked? Sorry to comment a few days late, and you probably already figured this out, but I add the salt and oil to the rice and water before I cook and the lime and cilantro after. Definitely not too late on the rice… I’m sure I will make it many times moving forward! I actually squeezed in a combination of lemon, lime, and orange because I read that Chipotle uses a “citrus juice,” and I thought that worked well. Thank you for the advice about the brining… Brining has made an amazing difference in other chicken dishes I’ve made, but next time I’ll just skip that step since there’s already enough salt in the marinade. Makes it even easier! Thank you again for taking the time to come up with such a great recipe! Thanks, Emily! I will try your combo of citrus next time! And you’re certainly welcome! Oh my god you are a genius. I just made this and it tastes exactly like chipotle’s chicken. I used half breasts, half thighs and marinated for 24 hours. I brined the chicken first and it was a little salty, so I think next time I’ll just leave the salt out of the marinade after brining it. Absolutely amazing recipe. Bravo! I wanted to comment on the brining – since the chicken sits it the salty marinade for quite a while, the marinade actually acts like a brine. If you feel like skipping the brining, I think you’re more than safe here. I’ve started brining more of my chicken for all kinds of recipes, too – I think a lot of restaurants do that and it’s why chicken tastes so much more flavorful when eating at a restaurant – a lot of them also inject with oils, too but I’ve never wanted to take things that far! I don’t need to worry about salt intake though. Did you use a chipotle chile from a can, just without the sauce, or the kind that comes in a little bag? Hi Emily, that’s exactly what I used, the canned chipotle in adobo sauce, but I just remove the chilis from the sauce; I don’t make any effort to wipe them clean or anything, just pull them out and use as is. That was a great question and I’ll put a clarification in the recipe. 🙂 Thanks for stopping by and letting me know! Awesome, thanks for the clarification. Just stuck my chicken in to marinate for 24 hours before I cook it tomorrow – can’t wait to try it! Hi, you wouldn’t believe how many recipes and how long I’ve looked for the Chipotle chicken. This one was so differnt, but I decided to try it anyway and you did it! Wow, better you than me! Plus I’ve been looking at a lot of your recipes. Sorry to comment so much, but it’s like you wrote down all the recipes I want to try! Thanks! And if any body out there wants Chipotlel chicken, this is amazing. I’m pinning! Thanks much, Bethanie! This was one of the toughest recipes I’ve made, because if I wanted to claim it tasted like Chipotle, I felt it really should taste like it! Plus I started off with a whole different direction – I never would have guessed it was so easy!